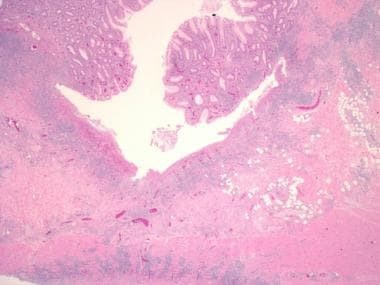 Untreated CD is characterized by transmural (full-thickness) inflammation, involvement of discontinuous segments of the intestine (skip areas), and, in a proportion of cases, by non-necrotizing granulomas composed of epithelioid histiocytes. Patients present with a range of symptoms, including crampy abdominal pain and diarrhea, which may be complicated by intestinal fistulas, particularly after surgical intervention, by intramural abscesses, and by bowel obstruction. The diagnosis of CD can be difficult, and the proper clinical separation of this entity from UC has important therapeutic implications. Consequently, a thorough understanding of the clinical, radiologic, endoscopic, and pathologic features of CD, as well as effective communication between the pathologist and the managing clinicians, is essential to diagnostic accuracy. 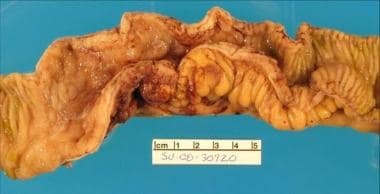 Below are examples of some gross features of Crohn disease. 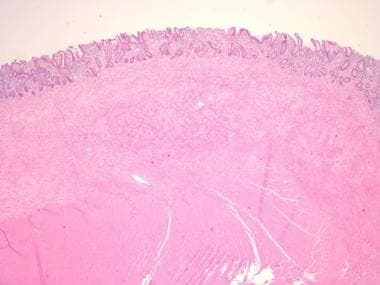 Mucosal pseudopolyps (inflammatory pseudopolyps) of the terminal ileum in a patient with Crohn disease. These polyps can reach giant proportions, up to 5 cm in maximum dimension, and are often seen on the proximal side of an ulcerated stricture (a "sentinel" inflammatory polyp). Cobblestone change of the mucosa of the terminal ileum in a patient with Crohn disease. Communicating fissures and crevices in the mucosa separate islands of more intact, edematous epithelium. See Crohn Disease and Imaging in Crohn Disease for more information on these topics. The incidence and prevalence of the disease (especially colonic CD) are steadily increasing, mainly in northern climates and urban areas, but CD is also becoming more common in regions such as Africa, South America, and Asia. Although this condition can occur at any age, there are 2 peaks of incidence, one in early adulthood (range, teens–20s) and another in the 60-70 year age group. Males and females are affected, but there is a slight female predilection for the disease. See Crohn Disease and NOD2/CARD15 for more information on this topic. It has also been proposed that neutrophil dysfunction may play a role in altered innate immunity early in the development of CD. [32, 33] At this point in time, the exact defects and mechanisms involved in disease pathogenesis are yet to be elucidated, and research is ongoing. Immunosuppression remains the mainstay of CD therapy, and it is likely that a combination of derangements that alter mucosal immunity and suppress immunoregulation is crucial in the development of this disease. Unlike ulcerative colitis, Crohn disease (CD) can occur at any point along the gastrointestinal tract. The most commonly involved sites at presentation are the terminal ileum, ileocecal valve, and cecum. Crampy, lower right quadrant or periumbilical pain that is often relieved by defecation – Some patients report more diffuse and constant pain. Prolonged nonbloody diarrhea with accompanying weight loss and possible malabsorption syndromes – If the colon is involved, the diarrhea may contain blood, mucus, and pus. Chronic, transmural inflammation can lead to fissures in the bowel wall with ensuing fistulas and abscesses. Fistulas may develop between the bowel and other organs, including enteroenteric fistulas, enterogastric, enterovaginal, enterocutaneous, and enterovesical fistulas. These can present as feculent vomiting or vaginal discharge, frequent urinary tract infections, pneumouria, fecaluria, and feculent soiling of skin lesions. Fistulas are significantly more common in postsurgical patients, an important reason why surgical intervention is deferred in favor of medical intervention, whenever possible. Retroperitoneal, intraperitoneal, and perianal/perirectal abscesses are common. 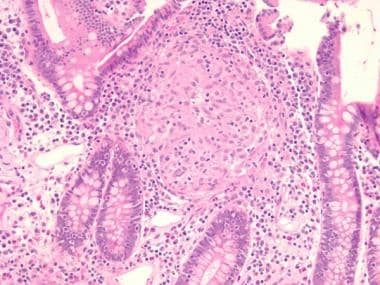 Patients with Crohn colitis are at increased risk to develop intraepithelial neoplasia, also known as dysplasia, and colonic adenocarcinoma. Patients should begin periodic regular colonoscopic surveillance for dysplasia and carcinoma beginning approximately 8-10 years after the diagnosis of Crohn colitis. Patients with concomitant primary sclerosing cholangitis are thought to be at increased risk for colorectal neoplasia compared with other Crohn patients, but the relative risk is better defined for patients with ulcerative colitis and primary sclerosing cholangitis. In addition, strictures may harbor malignancy. NOTE: Extreme care should be taken to avoid labeling the patient with Crohn disease at first biopsy. It is preferable in this clinical context to provide a descriptive diagnosis with a differential diagnosis. Appropriate clinical follow-up and subsequent biopsies will usually resolve the diagnostic dilemma. Rigid thickening of the involved segment of bowel wall is typical in Crohn disease, as seen in the image below. Opened small bowel in a patient with Crohn disease. Note the thickened and edematous bowel wall and the fat wrapping at the cut margin. The bowel wall is more normal at the left and right cut margins. Fat wrapping on the serosal surface of the terminal ileum in Crohn disease. Fat wrapping often correlates directly with underlying strictures, stenosis, or areas of previous transmural inflammation. Strictures, especially single, long segment strictures in the terminal ileum (leading to the string sign of Kantor on computed tomography [CT] scan) are classic, but multiple shorter strictures can also be seen. See the image below. A Crohn stricture of the ileum demonstrating the marked thickening of the bowel wall and prominent serosal fat wrapping surround the strictured area. The mucosal surface shows patchy lesional distribution with sharply delineated areas of disease surrounded by normal mucosa. Even in extensive disease, there are nearly always intervening patches of normal bowel with careful examination. In addition, linear and serpiginous mucosal ulcers with intervening mucosal edema lead to a classic gross "cobblestoned" appearance of the mucosa, as shown in the images below. Many of the classic microscopic findings were described in cases of bowel resection and in an era before the advent of immunosuppressive therapy. Pathologists currently face the challenge of rendering a pathologic diagnosis based on limited superficial mucosal biopsy samples obtained at endoscopy, often in the setting of previous treatment with anti-inflammatory medications. The hint of "skip lesions" – Mucosal fragments from the same level of the colon have variable microscopic findings. The fissures are often longitudinally oriented, knifelike clefts lined by granulation tissue, epithelioid histiocytes, and giant cells, as depicted in the following images. Deep knifelike, fissuring, transmural ulcer in Crohn disease. Deep, fissuring ulcer in a patient with Crohn disease. Note the increase in submucosal inflammation and scattered lymphoid aggregates. Focal, transmural inflammation consisting of lymphocytes, plasma cells, and neutrophils with large lymphoid aggregates is classic for CD. Cryptitis and crypt abscesses are common. The lymphoid aggregates are usually noted in the mucosa and submucosa, although they can be located throughout the bowel wall and are characteristically seen in the subserosal fat, following the vasculature. See the images below. A crypt abscess demonstrating active, neutrophilic inflammation in Crohn disease. 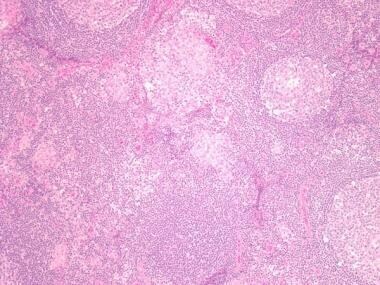 Prominent lymphoid aggregates and granuloma in the muscularis propria and pericolic fat of patient with Crohn disease. The inflammation extends through the full thickness of the bowel wall. Submucosal involvement by lymphoid aggregates in Crohn disease, and marked expansion/duplication of the muscularis mucosae, indicative of previous full-thickness mucosal injury. 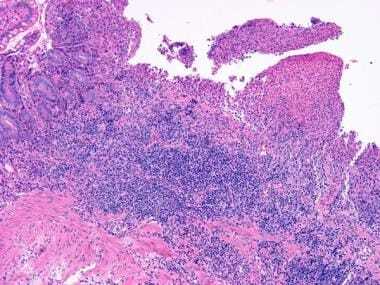 The granulomas consist of non-necrotizing, well-circumscribed groups of epithelioid histiocytes, with or without accompanying giant cells of the Langerhans type (see the following images). 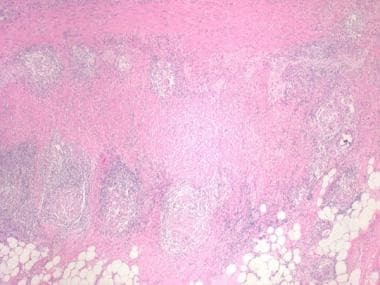 When present, granulomas are extremely helpful in securing the diagnosis of CD, but they are absent in 50-60% of cases. 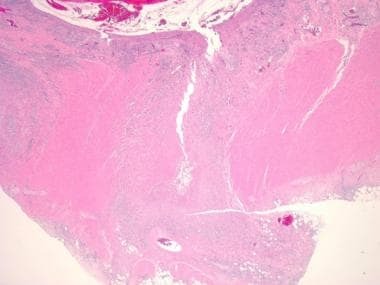 Moreover, granulomas are also seen in tuberculosis, yersiniosis, and can even be seen in ulcerative colitis in association with ruptured crypts. In general, caution must be employed when using granulomas as a diagnostic feature. 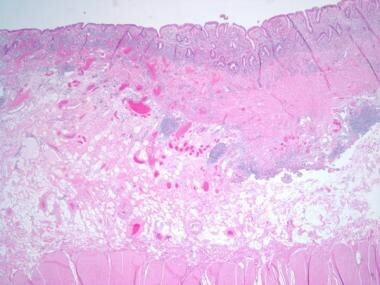 Granuloma in the mucosa of a Crohn disease patient. A granuloma in the mucosa of a Crohn disease patient. Multiple granulomas in the pericolic lymph nodes of a patient with Crohn disease. Although this finding is not specific for Crohn disease, when seen in association with other features of idiopathic inflammatory bowel disease, it supports the diagnosis of Crohn disease. Moreover, the lymph nodes may be the only area where granulomas are identified; thus, submission of several lymph nodes from the mesentery may be very helpful to confirm the diagnosis in some patients. Bowel wall thickening consisting of edema and fibrosis leading to splaying of the muscularis mucosae and distortion of the muscularis propria is present in CD (see the following image). Lymphangiectasia in the submucosa and subserosa is frequently observed as well. Submucosal neuromuscular hyperplasia in a Crohn patient. Such hyperplasia is indicative of previous full-thickness injury. 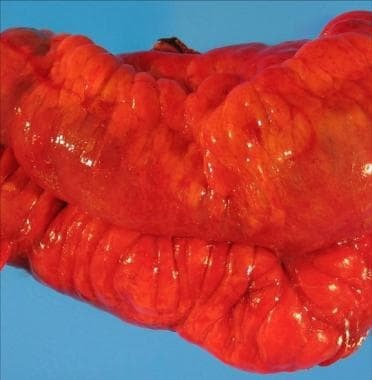 Aphthoid ulcer overlying a Peyer patch in the terminal ileum of a patient with Crohn disease. 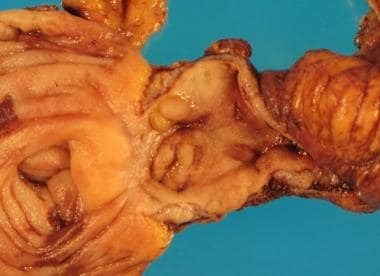 Muscularization of the fibrotic submucosa and crypt architectural disorganization are features of chronic and so-called "burned out" CD and may be the only remaining evidence of disease in certain cases. See the image below. Patchy, prominent submucosal fibrosis, often associated with focal neuromuscular hyperplasia, with associated mucosal architectural distortion in Crohn disease, which is indicative of chronic inflammatory insult. The patchy nature is also typical of Crohn disease. Immunohistochemistry has a minimal role, at most, in the diagnosis of Crohn disease (CD). Immunohistochemical stains for cytomegalovirus may be useful when a patient experiences a flare of disease while on immunosuppressive therapy—to exclude reactivation of latent viral infection or new viral infection as a cause of the inflammation. It is useful for the clinician to provide the pathologist with information regarding this concern, when applicable, to prompt consideration of special staining. The main features of CD that separate it from UC include the presence of skip lesions, granulomas, transmural inflammation, fissures, and/or involvement of any part of the gastrointestinal tract. UC is generally limited to the colon, apart from minimal distal "back-wash" ileitis; however, this condition may also manifest cecal or appendiceal patches of involvement that can simulate the "skip" lesions of CD. More typically, ulcerative colitis in its untreated state is a continuous process, worse distally, with increased span of involvement distal to proximal, as the disease progresses. Moreover, ulcerative colitis usually involves only the mucosal layer of the bowel, and, in some cases, superficial submucosa, unless there is fulminant colitis (toxic megacolon). In addition, treatment can markedly alter the apparent pattern of involvement by location. For example, steroid enema treatment of UC may eradicate endoscopic and histologic evidence of rectal injury and inflammation, leaving more severe inflammation in the proximal colon. Without complete clinical information regarding the endoscopic appearance and the history of treatment, the pathologist may misconstrue the biopsy findings and render an incorrect diagnosis. It is critical for the pathologist and the managing physician to recognize that "indeterminate colitis" is not a third category of disease, but that it is a diagnosis of idiopathic inflammatory bowel disease (IIBD), not otherwise specified, pending additional information. Features that assist in defining CD in this setting are the presence of granulomas, transmural lymphoid aggregates, and creeping fat; however, these findings may be noted only in resection specimens. Classification of the type of IIBD may be possible with additional clinical history, with biopsies of small intestine or stomach, or with disease recurrence and progression. Infectious etiologies, especially yersiniosis and tuberculosis, can lead to a similar clinical and histopathologic picture as Crohn disease (CD) and must be considered. [39, 69, 57, 62] This is particularly important, given the risk for systemic infection if the patient is placed on immunosuppressive treatment for presumed CD. Therefore, it is strongly recommended that the endoscopic and managing physicians consider special studies, including special histologic stains for microorganisms, and even including polymerase chain reaction (PCR), to exclude infection, if there is any significant travel or exposure history, even remote. Conversely, early or treated CD may manifest regionally as microscopic disease (focal active colitis) in a pattern otherwise typical of infectious or so-called "acute self-limited colitis." 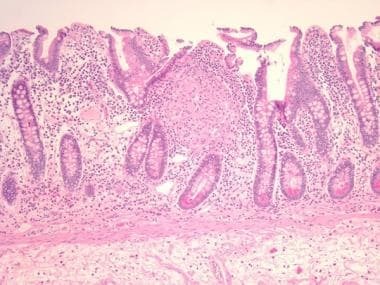 Diverticular disease may be associated with active crypt injury in peridiverticular mucosa in a pattern that is indistinguishable from active Crohn disease (CD). Concomitant active or active chronic injury in nearby mucosa unassociated with diverticular ostia favors a diagnosis of CD. 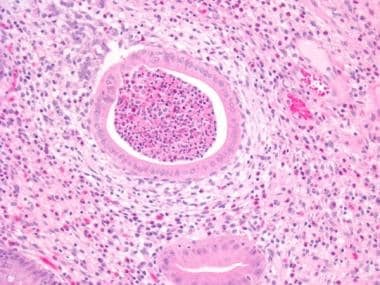 Ischemia may result in histologic changes that mimic Crohn disease, including full-thickness mucosal ulcerations and injury, with crypt architectural remodeling and pseudopyloric metaplasia, also known as "ulcer-associated changes" or "ulcer-associated cell lineage" (UACL). Crohn BB, Ginzburg L, Oppenheimer GD. Landmark article Oct 15, 1932. Regional ileitis. A pathological and clinical entity. By Burril B. Crohn, Leon Ginzburg, and Gordon D. Oppenheimer. JAMA. 1984 Jan 6. 251(1):73-9. [Medline]. Lockhart-Mummery HE, Morson BC. 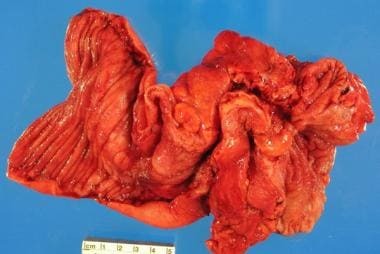 Crohn's disease of the large intestine. Gut. 1964 Dec. 5:493-509. [Medline]. [Full Text]. Feakins RM. Ulcerative colitis or Crohn's disease? Pitfalls and problems. Histopathology. 2014 Feb. 64(3):317-35. [Medline]. CDC. Epidemiology of the IBD. Centers for Disease Control and Prevention. March 31, 2015. Available at https://www.cdc.gov/ibd/ibd-epidemiology.htm. Accessed: April 4, 2017. Ye Y, Pang Z, Chen W, Ju S, Zhou C. The epidemiology and risk factors of inflammatory bowel disease. Int J Clin Exp Med. 2015. 8(12):22529-42. [Medline]. Kenny EE, Pe'er I, Karban A, et al. A genome-wide scan of Ashkenazi Jewish Crohn's disease suggests novel susceptibility loci. PLoS Genet. 2012. 8(3):e1002559. [Medline]. Fiocchi C. Inflammatory bowel disease: etiology and pathogenesis. Gastroenterology. 1998 Jul. 115(1):182-205. [Medline]. Kim DH, Cheon JH. Pathogenesis of inflammatory bowel disease and recent advances in biologic therapies. Immune Netw. 2017 Feb. 17(1):25-40. [Medline]. Farmer RG, Michener WM, Mortimer EA. Studies of family history among patients with inflammatory bowel disease. Clin Gastroenterol. 1980 May. 9(2):271-7. [Medline]. Satsangi J, Parkes M, Jewell DP. Molecular genetics of Crohn's disease: recent advances. Eur J Surg. 1998 Dec. 164(12):887-91. [Medline]. Hugot JP, Chamaillard M, Zouali H, et al. Association of NOD2 leucine-rich repeat variants with susceptibility to Crohn's disease. Nature. 2001 May 31. 411(6837):599-603. [Medline]. Meinzer U, Hugot JP. Nod2 and Crohn's disease: many connected highways. Lancet. 2005 May 21-27. 365(9473):1752-4. [Medline]. Barrett JC, Hansoul S, Nicolae DL, et al. Genome-wide association defines more than 30 distinct susceptibility loci for Crohn's disease. Nat Genet. 2008 Aug. 40(8):955-62. [Medline]. [Full Text]. Lesage S, Zouali H, Colombel JF, et al. Genetic analyses of chromosome 12 loci in Crohn's disease. Gut. 2000 Dec. 47(6):787-91. [Medline]. [Full Text]. Hugot JP, Laurent-Puig P, Gower-Rousseau C, et al. Mapping of a susceptibility locus for Crohn's disease on chromosome 16. Nature. 1996 Feb 29. 379(6568):821-3. [Medline]. Cummings JR, Cooney R, Pathan S, et al. Confirmation of the role of ATG16L1 as a Crohn's disease susceptibility gene. Inflamm Bowel Dis. 2007 Aug. 13(8):941-6. [Medline]. Massey DC, Parkes M. Genome-wide association scanning highlights two autophagy genes, ATG16L1 and IRGM, as being significantly associated with Crohn's disease. Autophagy. 2007 Nov-Dec. 3(6):649-51. [Medline]. Cummings JR, Ahmad T, Geremia A, et al. Contribution of the novel inflammatory bowel disease gene IL23R to disease susceptibility and phenotype. Inflamm Bowel Dis. 2007 Sep. 13(9):1063-8. [Medline]. Parkes M, Barrett JC, Prescott NJ, et al. Sequence variants in the autophagy gene IRGM and multiple other replicating loci contribute to Crohn's disease susceptibility. Nat Genet. 2007 Jul. 39(7):830-2. [Medline]. [Full Text]. Cooper JG, Purcell GP. Data mining for correlations between diet and Crohn's disease activity. AMIA Annu Symp Proc. 2006. 897. [Medline]. [Full Text]. Weinstock JV, Elliott DE. Helminths and the IBD hygiene hypothesis. Inflamm Bowel Dis. 2009 Jan. 15(1):128-33. [Medline]. De Hertogh G, Geboes K. Crohn's disease and infections: a complex relationship. MedGenMed. 2004 Aug 10. 6(3):14. [Medline]. [Full Text]. Travis SP. Mycobacteria on trial: guilty or innocent in the pathogenesis of Crohn's disease?. Eur J Gastroenterol Hepatol. 1995 Dec. 7(12):1173-6. [Medline]. Van Kruiningen HJ. Lack of support for a common etiology in Johne's disease of animals and Crohn's disease in humans. Inflamm Bowel Dis. 1999 Aug. 5(3):183-91. [Medline]. Ekbom A, Daszak P, Kraaz W, Wakefield AJ. Crohn's disease after in-utero measles virus exposure. Lancet. 1996 Aug 24. 348(9026):515-7. [Medline]. Morris DL, Montgomery SM, Thompson NP, Ebrahim S, Pounder RE, Wakefield AJ. Measles vaccination and inflammatory bowel disease: a national British Cohort Study. Am J Gastroenterol. 2000 Dec. 95(12):3507-12. [Medline]. Thompson NP, Montgomery SM, Pounder RE, Wakefield AJ. Is measles vaccination a risk factor for inflammatory bowel disease?. Lancet. 1995 Apr 29. 345(8957):1071-4. [Medline]. Wakefield AJ, Ekbom A, Dhillon AP, Pittilo RM, Pounder RE. Crohn's disease: pathogenesis and persistent measles virus infection. Gastroenterology. 1995 Mar. 108(3):911-6. [Medline]. Day DW, Jass JR, Price AB, et al. Morson and Dawson's Gastrointestinal Pathology. 4th ed. Malden, Mass: Blackwell Science Ltd; 2003. Brand S. Crohn's disease: Th1, Th17 or both? The change of a paradigm: new immunological and genetic insights implicate Th17 cells in the pathogenesis of Crohn's disease. Gut. 2009 Aug. 58(8):1152-67. [Medline]. Kobayashi T, Okamoto S, Hisamatsu T, et al. IL23 differentially regulates the Th1/Th17 balance in ulcerative colitis and Crohn's disease. Gut. 2008 Dec. 57(12):1682-9. [Medline]. Korzenik JR, Dieckgraefe BK. Is Crohn's disease an immunodeficiency? A hypothesis suggesting possible early events in the pathogenesis of Crohn's disease. Dig Dis Sci. 2000 Jun. 45(6):1121-9. [Medline]. Korzenik JR. Is Crohn's disease due to defective immunity?. Gut. 2007 Jan. 56(1):2-5. [Medline]. [Full Text]. Silverberg MS, Satsangi J, Ahmad T, et al. Toward an integrated clinical, molecular and serological classification of inflammatory bowel disease: Report of a Working Party of the 2005 Montreal World Congress of Gastroenterology. Can J Gastroenterol. 2005 Sep. 19 Suppl A:5-36. [Medline]. Turner D, Griffiths AM. Esophageal, gastric, and duodenal manifestations of IBD and the role of upper endoscopy in IBD diagnosis. Curr Gastroenterol Rep. 2009 Jun. 11(3):234-7. [Medline]. Geboes K, Janssens J, Rutgeerts P, Vantrappen G. Crohn's disease of the esophagus. J Clin Gastroenterol. 1986 Feb. 8(1):31-7. [Medline]. Rothfuss KS, Stange EF, Herrlinger KR. Extraintestinal manifestations and complications in inflammatory bowel diseases. World J Gastroenterol. 2006 Aug 14. 12(30):4819-31. [Medline]. Eade MN, Cooke WT, Williams JA. Liver disease in Crohn's disease. A study of 100 consecutive patients. Scand J Gastroenterol. 1971. 6(3):199-204. [Medline]. Mekhjian HS, Switz DM, Melnyk CS, Rankin GB, Brooks RK. Clinical features and natural history of Crohn's disease. Gastroenterology. 1979 Oct. 77(4 Pt 2):898-906. [Medline]. Farmer RG, Hawk WA, Turnbull RB Jr. Clinical patterns in Crohn's disease: a statistical study of 615 cases. Gastroenterology. 1975 Apr. 68(4 Pt 1):627-35. [Medline]. Cayci M, Bostanci EB, Turhan N, et al. The analysis of clinico-pathologic characteristics in patients who underwent surgery due to stricturing and non-perineal fistulizing forms of Crohn's disease: a retrospective cohort study. Int J Surg. 2015 Mar. 15:49-54. [Medline]. Burgdorf W. Cutaneous manifestations of Crohn's disease. J Am Acad Dermatol. 1981 Dec. 5(6):689-95. [Medline]. Greenstein AJ, Janowitz HD, Sachar DB. The extra-intestinal complications of Crohn's disease and ulcerative colitis: a study of 700 patients. Medicine (Baltimore). 1976 Sep. 55(5):401-12. [Medline]. Enlow RW, Bias WB, Arnett FC. The spondylitis of inflammatory bowel disease. Evidence for a non-HLA linked axial arthropathy. Arthritis Rheum. 1980 Dec. 23(12):1359-65. [Medline]. Ferguson RH. Arthritis associated with inflammatory bowel disease. Minn Med. 1981 Mar. 64(3):165-6. [Medline]. Itzkowitz SH. Inflammatory bowel disease and cancer. Gastroenterol Clin North Am. 1997 Mar. 26(1):129-39. [Medline]. Brentnall TA, Haggitt RC, Rabinovitch PS, et al. Risk and natural history of colonic neoplasia in patients with primary sclerosing cholangitis and ulcerative colitis. Gastroenterology. 1996 Feb. 110(2):331-8. [Medline]. Morson BC. Pathology of Crohn's disease. Ann R Coll Surg Engl. 1990 May. 72(3):150-1. [Medline]. [Full Text]. Desreumaux P, Ernst O, Geboes K, et al. Inflammatory alterations in mesenteric adipose tissue in Crohn's disease. Gastroenterology. 1999 Jul. 117(1):73-81. [Medline]. Sheehan AL, Warren BF, Gear MW, Shepherd NA. Fat-wrapping in Crohn's disease: pathological basis and relevance to surgical practice. Br J Surg. 1992 Sep. 79(9):955-8. [Medline]. Morson BC. The early histological lesion of Crohn's disease. Proc R Soc Med. 1972 Jan. 65(1):71-2. [Medline]. [Full Text]. Yantiss RK, Odze RD. Diagnostic difficulties in inflammatory bowel disease pathology. Histopathology. 2006 Jan. 48(2):116-32. [Medline]. Morson BC. 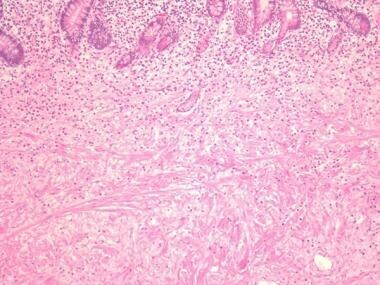 Histopathology of Crohn's disease. Scand J Gastroenterol. 1971. 6(7):573-5. [Medline]. Chambers TJ, Morson BC. The granuloma in Crohn's disease. Gut. 1979 Apr. 20(4):269-74. [Medline]. [Full Text]. Mooney EE, Walker J, Hourihane DO. Relation of granulomas to lymphatic vessels in Crohn's disease. J Clin Pathol. 1995 Apr. 48(4):335-8. [Medline]. [Full Text]. Wakefield AJ, Sankey EA, Dhillon AP, et al. Granulomatous vasculitis in Crohn's disease. Gastroenterology. 1991 May. 100(5 Pt 1):1279-87. [Medline]. Shepherd NA. Pathological mimics of chronic inflammatory bowel disease. J Clin Pathol. 1991 Sep. 44(9):726-33. [Medline]. [Full Text]. Hanby AM, Wright NA. The ulcer-associated cell lineage: the gastrointestinal repair kit?. J Pathol. 1993 Sep. 171(1):3-4. [Medline]. Wright NA, Pike C, Elia G. Induction of a novel epidermal growth factor-secreting cell lineage by mucosal ulceration in human gastrointestinal stem cells. Nature. 1990 Jan 4. 343(6253):82-5. [Medline]. Riddell RH, Goldman H, Ransohoff DF, et al. Dysplasia in inflammatory bowel disease: standardized classification with provisional clinical applications. Hum Pathol. 1983 Nov. 14(11):931-68. [Medline]. Farmer M, Petras RE, Hunt LE, Janosky JE, Galandiuk S. The importance of diagnostic accuracy in colonic inflammatory bowel disease. Am J Gastroenterol. 2000 Nov. 95(11):3184-8. [Medline]. Geboes K. Crohn's disease, ulcerative colitis or indeterminate colitis--how important is it to differentiate?. Acta Gastroenterol Belg. 2001 Apr-Jun. 64(2):197-200. [Medline]. Haggitt RC, Appelman HD, Correa P, et al. 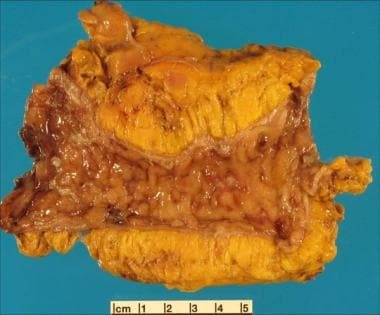 Carcinoma or dysplasia in Crohn's disease. Arch Pathol Lab Med. 1982 Jun. 106(6):308-9. [Medline]. Ullman T, Odze R, Farraye FA. Diagnosis and management of dysplasia in patients with ulcerative colitis and Crohn's disease of the colon. Inflamm Bowel Dis. 2009 Apr. 15(4):630-8. [Medline]. [Full Text]. Geboes K, De Hertogh G. Indeterminate colitis. Inflamm Bowel Dis. 2003 Sep. 9(5):324-31. [Medline]. Geboes K, Colombel JF, Greenstein A, et al. Indeterminate colitis: a review of the concept--what's in a name?. Inflamm Bowel Dis. 2008 Jun. 14(6):850-7. [Medline]. Guindi M, Riddell RH. Indeterminate colitis. J Clin Pathol. 2004 Dec. 57(12):1233-44. [Medline]. [Full Text]. Geboes K, Van Eyken P. Inflammatory bowel disease unclassified and indeterminate colitis: the role of the pathologist. J Clin Pathol. 2009 Mar. 62(3):201-5. [Medline]. Podolsky DK. Inflammatory bowel disease. N Engl J Med. 2002 Aug 8. 347(6):417-29. [Medline]. Allison MC, Howatson AG, Torrance CJ, Lee FD, Russell RI. Gastrointestinal damage associated with the use of nonsteroidal antiinflammatory drugs. N Engl J Med. 1992 Sep 10. 327(11):749-54. [Medline]. Goldstein NS, Leon-Armin C, Mani A. Crohn's colitis-like changes in sigmoid diverticulitis specimens is usually an idiosyncratic inflammatory response to the diverticulosis rather than Crohn's colitis. Am J Surg Pathol. 2000 May. 24(5):668-75. [Medline]. Kirsner JB, Shorter RG. Recent developments in nonspecific inflammatory bowel disease (second of two parts). N Engl J Med. 1982 Apr 8. 306(14):837-48. [Medline]. Mayberry JF, Rhodes J. Epidemiological aspects of Crohn's disease: a review of the literature. Gut. 1984 Aug. 25(8):886-99. [Medline]. [Full Text]. Farraye FA, Odze RD, Eaden J, Itzkowitz SH. AGA technical review on the diagnosis and management of colorectal neoplasia in inflammatory bowel disease. Gastroenterology. 2010 Feb. 138(2):746-74, 774.e1-4; quiz e12-3. [Medline]. Farraye FA, Odze RD, Eaden J, et al. AGA medical position statement on the diagnosis and management of colorectal neoplasia in inflammatory bowel disease. Gastroenterology. 2010 Feb. 138(2):738-45. [Medline]. Bressenot A, Geboes K, Vignaud JM, Gueant JL, Peyrin-Biroulet L. Microscopic features for initial diagnosis and disease activity evaluation in inflammatory bowel disease. Inflamm Bowel Dis. 2013 Jul. 19(8):1745-52. [Medline]. Disclosure: Serve(d) as a speaker or a member of a speakers bureau for: College of American Pathologists<br/>Received consulting fee from ASCP for assistant editor ajcp.